Background: There are few studies on the inhibition effects of soy peptides on hepatocarcinoma cells. Further insight into the underlying relationship of soybean peptides and hepatocarcinoma needs to be addressed. Therefore, it is worthwhile investigating the possible mechanisms of soybean peptides, especially the hepatocarcinoma effects. Objective: In this study, we try to figure out the molecular mechanisms of soy peptides QRPR and HCQRPQ on HepG2 cells. Methods: First, we use the MTS assay to determine the effect on cell proliferation of soy peptides QRPR and HCQRPQ on HepG2 cells. Subsequently, we examine the apoptosis of HepG2 cells via transmission microscopy and Annexin V-FITC/PI assay induced by soybean peptides. The cell cycle distribution is analyzed using flow cytometry. Finally, we analyze the effects of soy peptides on the TNF-α expression via ELISA assays and the caspase-8 and caspase-3 expression level via western blot and the quantitative real-time PCR. Results: Soy peptides QRPR used in combination with HCQRPQ can inhibit the growth of HepG2 cells, and the cytotoxicity is low. The transmission microscopy and Annexin V-FITC/PI assay reveal that these two soy peptides induce apoptosis in HepG2 cells. Soy peptide-treated HepG2 cells accumulate in the G1 phase. ELISA shows that soy peptides reduce the secretion of TNF-α. The western blot and the quantitative real-time PCR results show that these soy peptides increased the expression of caspase-8 and caspase-3. Conclusion: We speculate that soy peptides QRPR used in combination with HCQRPQ can inhibit the growth of HepG2 cells through the TNF-α mediated pathway. 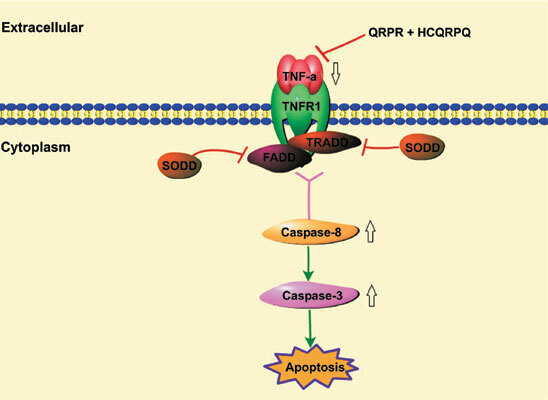 Soybean peptide, inhibit cell proliferation, caspase-3, TNF-α, human HepG2 cells, cytotoxicity.